Bonsai planting requires a commitment to careful watering, pruning, training and feeding. 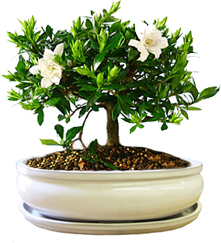 It is basically the art of growing miniature trees in small containers. As you can see from the photo above, we sell bonsai container that come with drain hole for great drainage and a saucer attached so that you won't have to worry about water run-off. The whole idea with bonsai to create a mini form of nature in a pot. Like small pine trees that twist and turn, rocks that look like boulders and a forest carpet made up of garden moss. This process is truly an art form and can be a casual hobby or an extreme planting and nurturing adventure. Finding a planter to start with is very easy to do at Arizona Pottery. Many of the small bonsai planters we sell are found in our ceramic section. Of course any small terracotta bowl or platter will work just as well. Once you decide on the container you will use, you need to venture out to your local garden nursery center. They have bonsai plants that have been trained, and trimmed to help get you started. Always ask them for specific directions on planting, watering, etc of that particular plant before taking it home. If you want to get an easy start to your bonsai experience we recommend that you start with succulent plants. They come in bizarre shapes and are small and compact in size. They are very easy to grow and have wonderful styles and colors. The bonsai oval bowl shown here is stuffed full with succulents. Small pines, junipers, and cypress that have twisted branches are really fun to use. They truly give the overall design a head start in creating an interesting and unique look. The best advice we can give is to keep the planter in partial shade, water often and enjoy the experience. Bonsai look difficult to grow but once you get your feet wet, we think it will become one of your most favorite things to do.